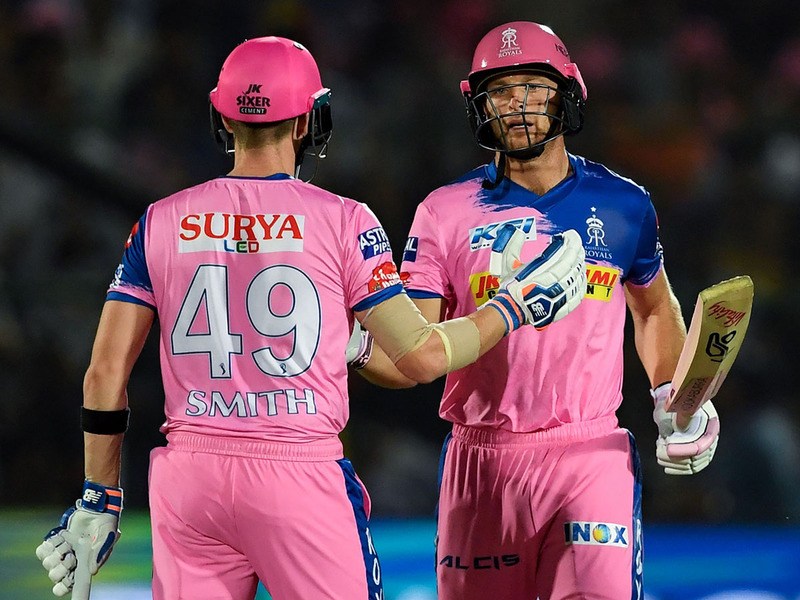 Jaipur: Jos Buttler and Steve Smith made sure Shreyas Gopal’s valiant effort with the ball did not go in vain, as Rajasthan Royals beat Royal Challengers Bangalore (RCB) by seven wickets in their IPL game at the Sawai Mansingh Stadium here on Tuesday. Leg-spinner Gopal (3/12) snared three wickets in his three overs to reduce RCB to 73/3 from a steady 49/0 and they could only manage 158/4 in 20 overs after being asked to bat first. Chasing a modest 159 for victory, Buttler (59; 43b; 8x4 1x6) made the most of a reprieve when he was dropped on 7 by RCB skipper Virat Kohli in the second over to bring up his seventh fifty in the last ten IPL games while Smith — dropped thrice — scored a 31-ball 38 before finally holing out to Umesh Yadav at long on off Mohammad Siraj. Yuzvendra Chahal (2/17) was the pick of the bowlers for RCB as he got the wickets of Royals’ captain Ajinkya Rahane (22) and Buttler but it was too little too late as Rahul Tripathi (34 off 23 not out) hit a six off the penultimate ball of the innings to take his team home. Royals needed five in the final over and as much as it looked like they would make heavy weather of a simple chase, Tripathi pulled Umesh for a maximum to complete the formalities with one run needed in two balls. RCB, thus, succumbed to their fourth straight loss to stay rock-bottom of the points table while Royals registered their first win. Earlier, Gopal was given the ball in the seventh over and the leg-spinner first broke skipper Kohli (23; 25b; 3x4) and Parthiv Patel’s 49-run partnership for the opening wicket, then cut short AB de Villiers and Shimron Hetymer’s stay at the crease in his next two overs as the visitors were reduced to 73/3 in 10.1 overs. Patel top-scored for RCB with a patient 41-ball 67 — his knock laced with nine fours and a six — while Marcus Stoinis was unbeaten on 31 off 28 balls and Moeen Ali played a nine-ball 18 run cameo to help the struggling outfit post a competitive total. In the final over, Jofra Archer (1/47) leaked 17 runs with Ali smashing him for a six and a four as RCB managed to score 51 runs in the last five overs. Rajasthan Royals beat Royal Challengers Bangalore by seven wickets. Royal Challengers Bangalore 158/4 (Parthiv Patel 67; Shreyas Gopal 3/12) Rajasthan Royals 164/3 in 19.5 overs (Jos Buttler 59, Steve Smith 38, Rahul Tripathi 34 not out; Yuzvendra Chahal 2/17).